I have to say that I admire my fellow Paruretics who publicly admit that they have Paruresis. They let the whole wide world know their shameful secret. These people run Support Groups, Forums, YouTube Channels, and are leading examples in the Association Forums of what Paruresis is and how to recover from it. I admire their openness, courage, and honesty. It’s not the easiest thing to talk about this condition and showing your face and voice in front of millions… it takes balls! My hats off to you! A couple of people have really stood out and helped me understand and acknowledge my disorder better. Check them out! You’ll be happy you did. So let’s take a minute and talk about these brave souls and how they have helped me along the way. It all started by doing a Google search online for Shy Bladder after I read a book called Shy Bladder Syndrome (links on the right). I saw some Videos about Shy Bladder, and they peak my curiosity. They lead me to a YouTube Channel called “Paruresis Exposed“. In it I saw man who goes by the name of Paruretic Max talking about Paruresis and the Breath Hold technique. Max is young and very well spoken. He openly talks about Shy Bladder and how it’s affected his life. I couldn’t stop watching. To hear someone verbalize his condition so well was startling. He has a very good handle on his disorder and life. I didn’t acknowledge Paruresis until I got older. In fact, I spent my whole youth hiding in shame. And here he is facing the world and speaking so comfortably about his greatest fear. He showed me that there is a future, there is hope, there is support. I often wonder what his friends and family think seeing him so exposed and out there. I would fear humiliation and ridicule. But Max acts like it’s no big deal. Nothing to be ashamed of. He talks about Bladder Shyness like he’s talking about the Weather. I admire that! If only I could be so free. His face is a spokesperson for Paruresis Recovery and I’m happy that people like him are able to stand up and share their experiences. I’m trying to do the same. Max not only spearheads the Paruresis Exposed Channel, but he runs his own blog over at Zen and the art of Reality. Thanks for putting yourself and your phobia on the line Max. 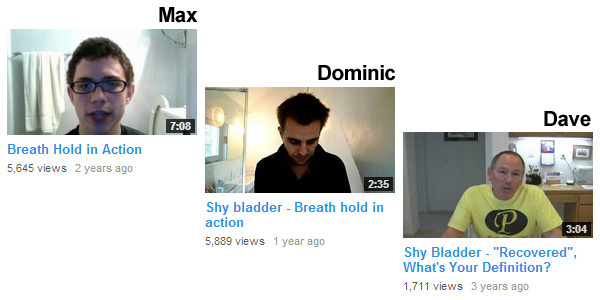 Dominic also has many YouTube videos in the Paruresis Exposed Channel. He is showing off the Breath Hold Technique (just like Max does) and pees in front of the camera. Years ago I had heard about something called “Breath Hold“, but Dominic took it one step further by combining Breath hold with his Pee Buddy (Gradual Exposure Therapy). I was amazed and inspired. It seemed that there was a way to cure (or recover) from Paruresis. I admire Dominic for being so bold as to film his shyness (with his Pee Buddy) and to show that Breath Hold does work (for some). I have yet to master this technique, I have tried, gave up, tried again… One day I hope to learn it. If you haven’t watched any of the videos on Paruresis Exposed, then I would highly advise it. It takes a lot of guts to do what they do. I would be very nervous about showing myself on camera and peeing in front of so many people that could hear me. I don’t know how he does it so calmly, but I give him props. Plus, he even went out of his way to make a new video showing his face during Breath Hold (per my request). If you have a request of your own, let him know, he’s a pretty cool guy and I’m sure he’ll help you out. Dave is over at www.Paruretic.org and his Paruretic Dave YouTube Channel. This man blows my mind! He’s like Superman to Paruretics. His courage and dedication is outstanding! He has videos that show what they do in Support Group Meetings and graduated steps with Bathroom Exposure. It’s amazing and A MUST SEE! How Daring! I don’t even think I could every so proudly proclaim that I was Pee Shy! Everyone would know that you have this disorder and you set yourself up for embarrassment. But not Dave! He faces his fears head on and I greatly admire that. I almost feel uneasy just watching the pro do it. It’s an eye opener for sure! I would want to hide in a corner, let alone stroll through a mall filled with thousands of observing, judging eyes. My heart beats just thinking about it. Plus, he’ll stand at the urinal for a long, long time (22 minutes) just to prove that it doesn’t matter what other people think. You can stand there all day and no one would care. Where would we be without people like this? And Dave is also a pro at Self-Catheterization. On his website, in the video’s section, he shows you step-by-step how to put in and use a Catheter… Yes, he shows it all! Not for the squeamish! That’s a brave man. He also talks about Drug Testing (illegal) and In-Home Desensitization (which is what I’m about to attempt). I suggest you check him out. He shows you there is nothing to be scared of. It’s a disorder that millions of people have and the only way to deal with it is to tackle it head on. Thanks Again to Max, Dominic, and Dave! Thank you guys, you have opened my eyes and my heart. You’ve shown me that I can handle this, that there is hope, and that I am NOT alone! I’m hoping my blog here can inspire others as well! I would love to make a difference in people’s lives. If you like my posts here, can relate, or have stories of your own, please speak up and be heard. I, and others, would greatly appreciate it and learn from it. The best way to overcome this crippling phobia, is to face it together! ← Things that make me want to Pee!